It was the Democrats and liberal MSM’s worst nightmare, President Donald Trump got to speech directly to the American people without any bias filter from the media, and the people loved it! According to CBS News, a whopping 76% of the people approved of his speech. Another 72% said they approved of the president’s ideas for immigration. Which means over 7 in 10 people agree that building a wall will prevent illegal immigration. “From our CBS News instant poll here following the president’s State of the Union, 76% of speech watchers said they approved of what they heard. 72% said they approved of the president’s ideas for immigration. But there were some controversial ideas there,” Glor reported Tuesday night. An overwhelming number of Republicans approved of Trump’s speech, while 30% of Democrats did as well. However, most importantly 82% of Independents approved of it. These days Democrats are a lost cause, the base and Independents is where elections are won. And while 97 percent of Republicans approved of the speech, far fewer Democrats who tuned in did (30 percent). Most independents did approve. Fifty-six of Americans who watched tonight feel the president’s speech will do more to unite the country, rather than divide it, although 36 percent don’t think it will change things much. Airing on ABC, CBS, FOX, NBC, Telemundo, Univision, PBS, CNN, CNNe, FOX Business, FOX News Channel and MSNBC in the 9 – 10 PM ET slot, the third longest SOTU in history topped Trump’s first official address to Congress in 2018 by over 1 million viewers. In a number that will also be important to the 45th POTUS, the address before the now Democrats’ dominated House of Representatives, the Senate and invited guests also beat Barack Obama’s second SOTU of January 25, 2011 by over 9%. That speech by the 44th POTUS was shown on the 11 outlets of ABC, CBS, FOX, NBC, Telemundo, Univision, CNN, Centric, CNBC, FOXNC, and MSNBC. 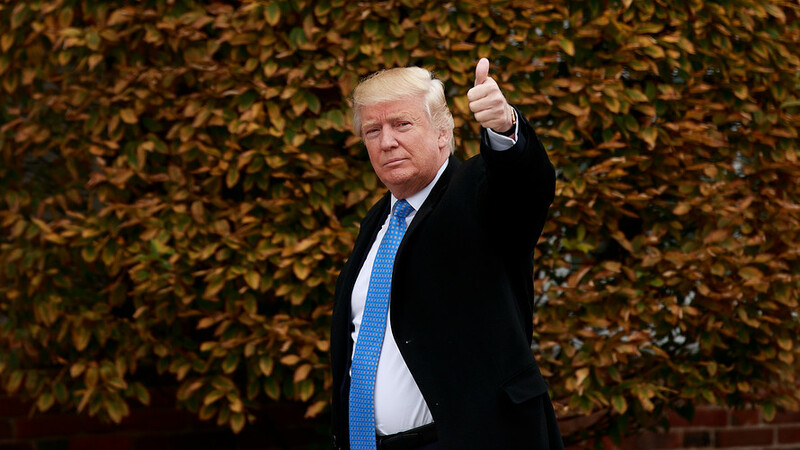 According to the most recent Rasmussen daily tracking poll, President Donald Trump is peaking just at the right time ahead of the 2018 midterm elections. Even though he is not on the ballot, what he has done in his first two years in office has been nothing short of miraculous and unrepresented. Especially with regards to the U.S. economy. The October jobs number of 250,000 jobs created may just be a game changer for this Tuesday. Coupled with increased wages, historic all-time low Hispanic unemployment, the Labor Force Participation at 66.2%, up from 66.0% in September, a record number of individuals participating in Labor Force at 28,500,000 and the United States added 32,000 new manufacturing jobs in October, more than 1,000 every day, including holidays and weekends. The Rasmussen Reports daily Presidential Tracking Poll for Friday shows that 51% of Likely U.S. Voters approve of President Trump’s job performance. Forty-seven percent (47%) disapprove. Also, the polls are trending toward Trump and the amazing job he has done with the economy. The latest Rasmussen Reports national telephone and online survey finds that 30% of Likely U.S. Voters view Trump as the most important issue to their vote in the upcoming elections. The economy is most important for 22%, followed by 15% who rank illegal immigration that way and 14% who say the same of Obamacare. 43% Say U.S. Heading in Right Direction … This is an amazing number compared to the past, especially during the Obama years where it was in the mid to upper 20′s. For the fourth week in a row, 43% of Likely U.S. 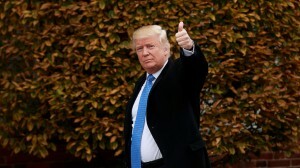 Voters think the country is heading in the right direction, this time according to a new Rasmussen Reports national telephone and online survey for the week ending October 25. This finding has been running in the 40s for most weeks this year after being in the mid- to upper 20s for much of 2016, President Obama’s last full year in office. As reported at the Miami Herald, Democrat Donna Shalala is training her opponent, Republican TV journalist Maria Elvira Salazar, by 2 percentage points in a recent Mason Dixon-Telemundo 51 poll. This is a district where President Trump lost by almost 20 percentage points in 2016. It would appear much has changed. This is another indication that maybe this blue wave that has been espoused by Democrats and their propaganda media cohorts, does not exist. Donna Shalala may be in trouble. Shalala, a Democrat running in a district that President Donald Trump lost by nearly 20 percentage points in 2016, is trailing Republican TV journalist Maria Elvira Salazar by 2 percentage points in a Mason Dixon-Telemundo 51 poll. The independent poll’s margin of error was 4 percentage points and included a pro-Trump non-party candidate who could siphon votes from Salazar. Salazar’s unique background as a journalist in a party dominated by President Donald Trump and her appeal with older, Spanish-speaking voters has enabled the GOP to remain competitive. Shalala, one of the most experienced first-time congressional candidates, won a competitive Democratic primary by less than 5 percentage points and has faced criticism from liberal Democrats and Republicans alike for her tenure leading the University of Miami, when campus janitors went on a hunger strike over low wages and the school acquired Cedars Medical Center. The poll of 625 registered likely voters was conducted from Oct. 1 to Oct. 6, before Shalala began airing a TV ad that attempts to tie Salazar to Trump. Forty-three percent of respondents approve of Trump while 46 percent disapprove, according to the poll, while Salazar has a net favorable rating of 22 percentage points and Shalala has a net favorability rating of 4 points, though more voters recognize her than Salazar. Forty-two percent of voters support Shalala while 44 percent support Salazar, with 13 percent undecided. 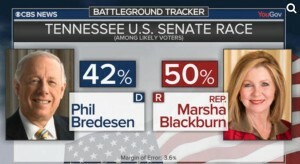 According to a recent CBS poll, Republican Marsha Blackburn has taken the lead over Democrat Phil Bredsen by 8 points. This shift has come about following the recent campaign rally with President Donald Trump in Johnson City, TN and the Brett Kavanaugh SCOTUS nomination process and vote. The tide has swung in Tennessee as Republicans have become energized. The actions by Democrats in the Kavanaugh nomination hearings and Democrat Bredesen’s refusal to say how he would have voted until the very end when he had to has cost him dearly. The fence-riding Bredesen was backed into a corner and forced to make a call. No matter what he did, he was doomed. Bredesen is a Democrat in a red state that Trump won easy in 2016. Bredesen has been trying to play the I am an independent card, even though he is running as a Democrat and tied to Senate minority leader Chuck Schumer (D-NY). This is second poll to have Blackburn in the lead and margin is growing. Look for Tennessee race to move to leans GOP from toss up. 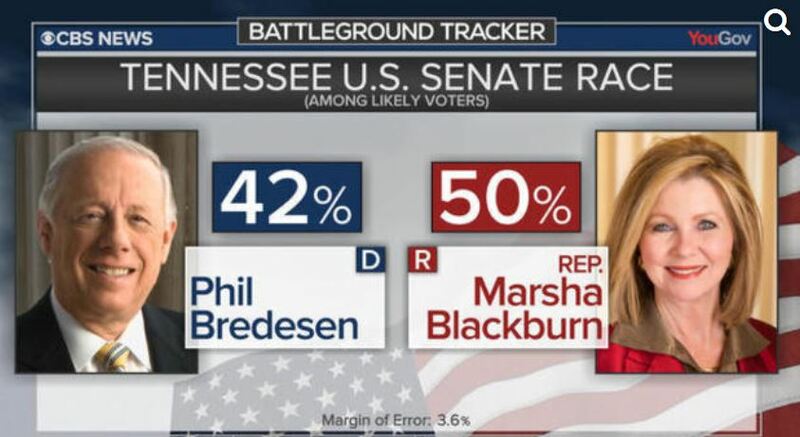 Republican Marsha Blackburn has an eight-point lead over Democrat Phil Bredsen in Tennessee’s U.S. Senate race, according to the latest poll from CBS News. The poll shows likely voters favor Blackburn over Bredesen 50% to 42%. Just last week, President Donald Trump held a Make America Great Again rally in Johnson City, intended to help Blackburn’s campaign. This is the beginning of the end for Bredesen and his good ole boy act. Now that Bredesen has stated he would have voted for Kavanaugh, Democrats, especially far left Democrats are jumping off the ship and tearing up their yard signs. INDEPENDENTS DISAPPROVE OF HOW DEMOCRATS HANDLED KAVANAUGH NOMINATION … HOW WILL THIS AFFECT THE MIDTERM ELECTIONS? As reported at the Washington Examiner, an overwhelming majority of independents disapprove with the Democrats handling of the Brett Kavanaugh SCOTUS nomination process. By a 28 point margin, independents disapprove of how Democrats Democrats handled the Supreme Court nomination of judge Kavanaugh. This cannot bode well for Democrats in the upcoming 2018 midterm elections. The Kavanaugh vote has energized both bases; however, the energy from the right is trending upwards ans appears to be in line with independents. The insanity from the LEFT is over the top as protesters, many paid, have taken this too far and jumped the shark. The more foolishness, disrespect and craziness, the more moderates and middle of the road folks think that we can never give these people power. This is what insanity and mob rule looks like … How do you think this plays with indies and middle America? After a blistering confirmation battle, Justice Brett Kavanaugh will take his seat for oral arguments on the U.S. Supreme Court with a skeptical public, a majority of which opposed his nomination. However, Democrats may not be able to exploit this fact in the upcoming elections as much as they hope, because the independent voters overwhelmingly disapprove of their own handling of the nomination by a 28-point margin, a new CNN/SSRS poll finds. What’s interesting, however, is even though Democrats on the surface would seem to have public opinion on their side, just 36 percent approved of how they handled the nomination, compared to 56 percent who disapproved. (Republicans were at 55 percent disapproval and 35 percent approval). A further breakdown finds that 58 percent of independents disapproved of the way the Democrats handled the nomination — compared to 30 percent who approved. (Independents also disapproved of Republicans handling of the matter, but by a narrower 53 percent to 32 percent margin).